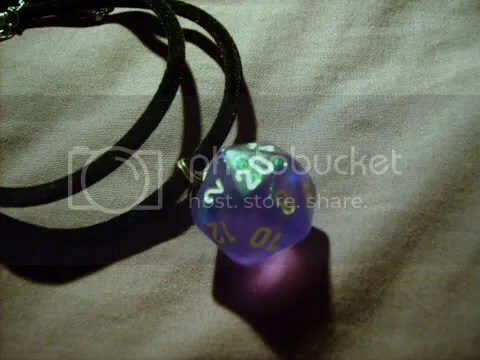 This pendant is from a collection I have up for sale and were made from a a single standard-sized shimmering Purple Borealis twenty-sided die with white numbers which stand out. Light reflects off the iridescent flecks within the dice, and beautiful colours not normally seen in dice or even glitter dice can be seen. Absolutely beautiful. All prices are not inclusive of shipping. All pendants come on a leather cord. I call dibbs on this one! Tell me how to pay and I’ll get the payment on it’s way! Sounds good to me. :D And squeee!!! Ok, so I’m a total dork and forgot I had requested this. Lucky for you tomorrow is pay day! So how do I go about the whole paypal stuffs so I can actually have this in my hot little hand?